Posted August 20, 2015 by Fat Finger & filed under Cool Technology, Industry Stories. It joins Apple – which launched a rival facility last year – in trying to convince shoppers to use their handsets, rather than plastic cards, to make in-store purchases. 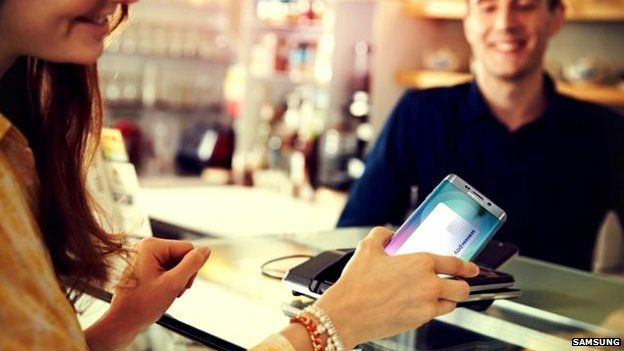 And Samsung believes it has one critical fact that will work in its favour: its tech works with a much larger number of existing payment terminals. In truth, it’s still unclear whether using mobiles to buy goods offline has much appeal beyond a novelty factor when it comes to non-geek members of the public. But with two of the biggest names in tech betting their mobile payment services will help their handsets stand out, the days of slipping a bulky wallet into your pocket or handbag could be numbered. Let’s start with the basics – where in the world can you use it? 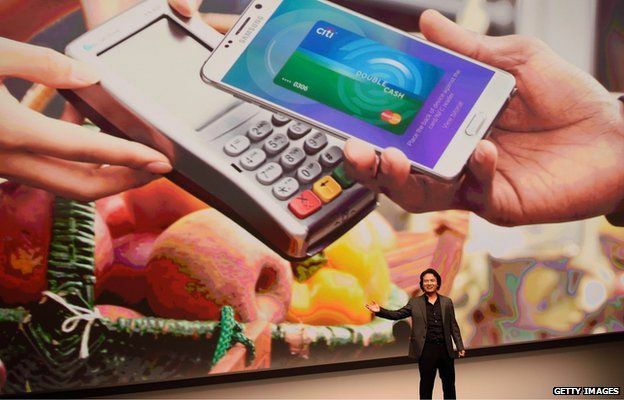 At launch, Samsung Pay is only available in the company’s home country. But it will expand to the US on 28 September, and the firm has indicated that the UK, Spain and China will be next to get the facility sometime in the near-future. That signals a more aggressive rollout than Apple Pay, which currently remains limited to the US and UK. However, there are two other additional factors to consider. And bank/credit card providers involved must be signed up to the scheme. Unlike Google Wallet and several other earlier payment apps, there’s no need to unlock the phone and launch a special app to get started. Assuming you’ve already entered your payment card details, all you need do is swipe up from the bottom of the device’s face and Samsung Pay will appear, even if the screen was turned off to begin with. Next, pick a credit card and scan your fingerprint or provide a Pin code. Finally, you have to bring the phone close to the payment terminal within 15 seconds to complete the sale. Will stores need to install special machines first? No – it should be able to work with two existing types of widely used kit. Like Apple Pay, Samsung’s service is designed to work existing “tap-and-go” terminals that use near field communication (NFC) transmissions. This is the technology that was widely deployed across the UK alongside the introduction of chip-and-pin cards. But Samsung Pay’s added trick is that it also works with magnetic stripe readers, which remain popular in the US and Asia. This is thanks to a proprietary technology it calls Magnetic Secure Transmission (MST). 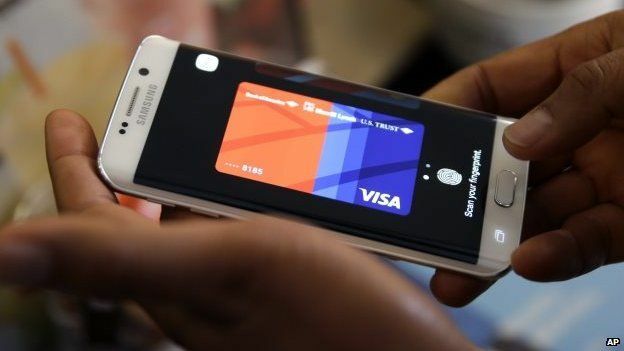 “Rather than swiping the card, which normally transmits the data, we are using electronic signals [made by alternating current through] coils inside the phone to send the signal over,” Thomas Ko, vice president of Samsung Pay, explained to the BBC.